Living just out outside of D.C., my wife and I often find ourselves in the district on the weekends, taking our daughter whatever museum is at the top of her list at the given moment. Today we visited the National Building Museum followed by the Smithsonian National Portrait Gallery. 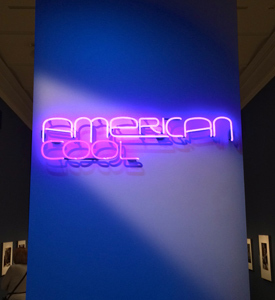 While in the latter, we stumbled upon a limited time exhibit called American Cool (which runs through September 7th). It is a photo account of a great many cool characters through recent American history, including Madonna, David Byrne, Sam Shepherd, Tom Waits, Paul Newman, Jimi Hendrix…and Steve Jobs. The Steve Jobs display took me somewhat by surprise. 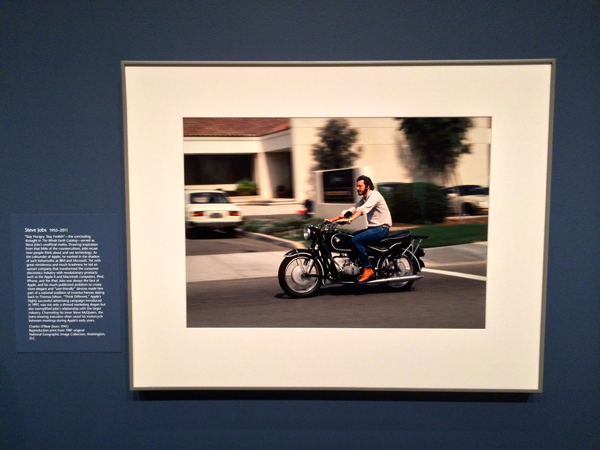 I mean, in my world he was beyond cool, but his presence in the exhibit was a surprise. It was good to see, though. And it makes sense, really. I wanted to share the photograph and accompanying text for the vast majority of readers who won’t be attending the exhibit. “Stay Hungry, Stay Foolish” — the concluding thought in The Whole Earth Catalog — served as Steve Job’s unofficial motto. Drawing inspiration from that bible of the counterculture, Jobs recast how people think about and use technology. As the cofounder of Apple, he worked in the shadow of such behemoths as IBM and Microsoft. Yet, with great nimbleness and much brashness he led an upstart company that transformed the consumer electronics industry with revolutionary products such as the Apple II and Macintosh computers, iPod, iPhone, and the iPad. Jobs was always the face of Apple, and his much-publicized ambition to create more elegant and “user-friendly” devices made him part of a national tradition of inventor-heros dating back to to Thomas Edison. “Think Different,” Apple’s highly successful advertising campaign introduced in 1997, was not only a shrewd marketing slogan but also exemplified Jobs’ relationship with the larger industry. Channeling his inner Steve McQueen, the jeans-wearing executive often raced his motorcycle between meetings during Apple’s early years. National Geographic Image Collection, Washington, D.C.
For anyone living in the D.C. area, the American Cool exhibit is definitely worth a look. This entry was posted in Just Rambling. Bookmark the permalink.